MIDI to CV conversion including polyphonic and MPE operation. 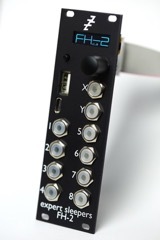 The FH-2 is simultaneously a USB MIDI host, a USB MIDI device, and also supports traditional 5-pin DIN MIDI. Support for drum triggers including triggers with velocity or accents. Support for automatic VCO calibration (similar to that in Silent Way). MIDI clock (in and out), analogue clock (in and out), or internal clock (BPM or tap tempo). LFO generation, including tempo-synced LFOs. The FH-2 has 8 high precision CV outputs, expandable to 64 with the FHX-1 Output Expander. Up to 64 extra gate/trigger/clock outputs can also be added with the FHX-8GT Gate Expander. The module can be completely configured via its own UI, but a convenient web-based configuration tool is also available here, which communicates with the module directly via MIDI SysEx. Up to 16 note polyphonic conversion, with optional pitch/gate/velocity etc. CVs per note. Also features arpeggiation, keyboard splits and more. Up to 16 simultaneous touches converted with full position/pressure/glide etc. per touch. Up to 64 outputs. Direct control of CVs from faders, flexible and syncable LFOs, triggers from pads etc. Multiple clock outs at different divisions, run/stop triggers etc. Groovebox, FH-2, or another module can be the clock master. All of the above, plus SysEx for configuration of the FH-2. 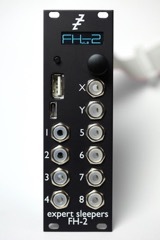 The FH-2 can operate as the clocking centre of your modular, also generating (syncable) LFOs, with no USB connection. The FH-2 was reviewed by c't magazine (musik kreativ special 2018). plus the power requirement of any attached USB device. See the manual for information on calculating the current draw on the +12V rail from the USB device. Class Compliant USB MIDI host. Class Compliant USB HID host (for mice, gamepads etc.). Class Compliant USB MIDI device (plug'n'play with macOS, Windows, Linux and iOS). Header for connecting FHX-1 or FHX-8GT expanders. Header for 5-pin DIN MIDI via a compatible breakout. An FH-1 may also be used as an expander, over USB. The FH-2 is available now. For purchasing links, please see Where To Buy.